Aquaculture spans pond to plate in R.I.
On a pontoon in Potter Pond in South Kingstown, harvesters sort Matunuck oysters. 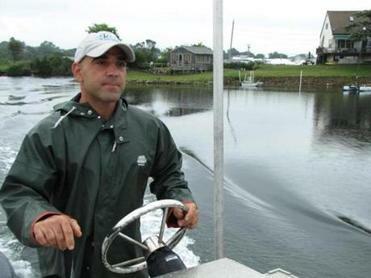 SOUTH KINGSTOWN — Perry Raso stands waist-deep in the gray-green waters of Potter Pond. The sky is spitting rain, but Raso barely notices as he pulls a plastic mesh bag from the pond’s sandy bed and extracts a handful of quarter-sized oysters. “Oysters are like wine. They take on the flavor and texture of where they are grown,” he said. I’m standing on the pontoon boat Raso, 35, uses to shuttle between the dock at his popular seafood restaurant, Matunuck Oyster Bar, and his seven-acre commercial aquaculture lease. Scanning the watery vista, I spot bags that stretch like stepping stones in seemingly endless neat lines beneath the surface. Each bag holds between 500 and 2,000 oysters, depending on the size of the oysters. Raso estimates he uses 10,000 bags. His farm, founded in 2002, produces about 500,000 market size oysters each year. He sells another 4 million to 5 million as 1.5-inch seed oysters. He also grows littleneck and cherrystone clams, but emphasizes that oysters are the mainstay of his business. A tour of 10 restaurants, from casual bistros to glitzy dining emporiums to no-frills oyster bars, that show the clamor for premium oysters in Toronto. Raso represents a new breed of aquaculturists who combine a love of farming with education, science, local ecology, and a global environmental outlook. Before starting the farm, Raso earned both bachelor’s and master’s degrees in aquaculture and fisheries technology from the University of Rhode Island. As a way of understanding the local estuarian environment, and the challenges of aquaculture on a global scale, Raso offers a monthly 90-minute tour of his oyster farm. Part education, part fun field trip, the tour provides oyster neophytes and aficionados an opportunity to learn more about what it takes to produce tasty bivalves. “Oysters grow by absorbing calcium from the water to make the shell. That’s why acid rain is causing huge problems in the west,” said Raso. One could say Raso absorbed his love of shellfish from his environment. He attended elementary school in Matunuck and by the time he was 12, was earning “$40 to $50 a day” digging clams in Point Judith Pond. After scuba diving for steamers and trapping eels, he headed off to college in Colorado but missed the water and returned to study in his home state. Owner Perry Raso, the restaurant dock behind him, manages the restaurant, the aquaculture farm, and the oyster sales business. In 2009, Raso opened Matunuck Oyster Bar on a narrow strip of land along Succotash Road between Point Judith and Potter ponds. “I didn’t have any restaurant experience, but I needed dock space. I didn’t think it would work,” he said. It has worked. This “farm-to-table and pond-to-plate” casual eatery, with tables inside and out, has won multiple “best” awards, and is busy year round for lunch and dinner. 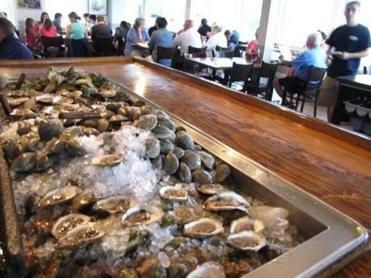 The raw bar features a selection of Rhode Island oysters, including his own Matunucks (grown in bags) and Potter Moons (grown on the sea floor), cherrystones, littlenecks, and jumbo shrimp. Appetizers and entrees include almost anything a seafood lover would crave, including chowder, baked clams, fried calamari, boiled and stuffed lobsters, fried clam bellies, fish and chips, and grilled or seared scallops, salmon, cod, and more. Burgers and steaks satisfy meat lovers, and vegetarian options such as penne pesto and salads round out the menu. 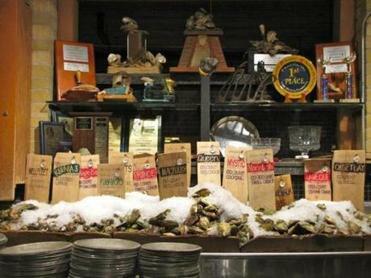 Shucked and not, the oysters waiting at Matunuck Oyster Bar draw lunch (and dinner) patrons all year round. Today, the organic vegetable farm — 10 cultivated acres in the field, and two large greenhouses — provides some of the ingredients for the restaurant’s dishes, such as salad greens, tomatoes, arugula, spinach, peppers, fennel, broccoli, cucumbers, fresh herbs, and more. Back on the boat, the sun breaks through the clouds in the late afternoon as Raso pilots the vessel back to the dock. We pass another pontoon where a half dozen people wearing slickers and boots are sorting through bags of oysters. “I definitely miss working on the oyster farm,” said Raso, whose responsibilities for the restaurant, farm, and oyster sales business keep him inside more than out. Approaching the restaurant, I see the tables have filled with patrons slurping oysters, drinking beer, and enjoying the salty fresh air. I can almost taste the oysters I’ll order when we’re back on terra firma. But first I have one last query: Does Raso like oysters? MATUNUCK OYSTER BAR 629 Succotash Road, Matunuck, R.I. 401-783-4202, www.rhodyoysters.com. 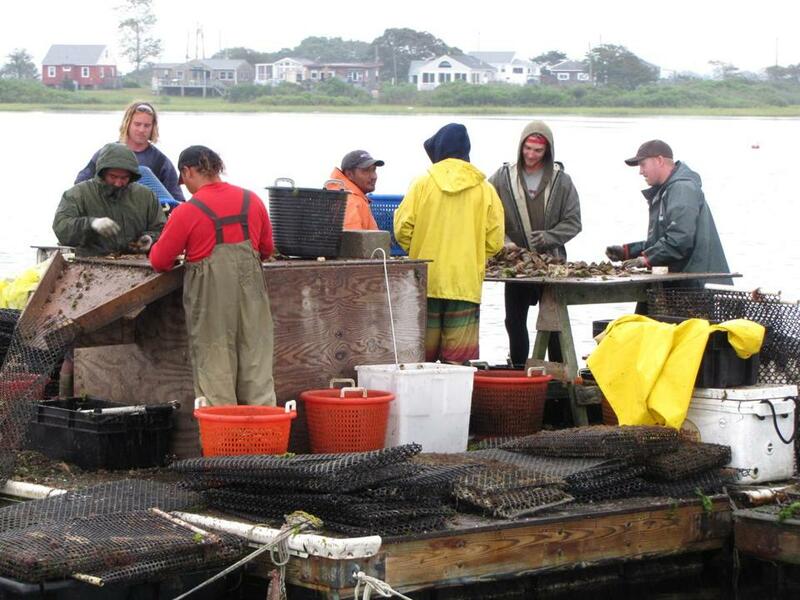 Shellfish farm tours start at 10 a.m. on last Sunday of each month; free.